Eating at fast-food restaurants while following a low-FODMAP diet for IBS or other digestive discomfort is tricky, but not impossible. The good news is, many major chains post nutritional information online to help you make informed choices. And while fast food isn’t always the most wholesome selection, it is often the reality for many of us with small children. When I end up at the drive-through window, I feel better knowing I have safe low-FODMAP options. 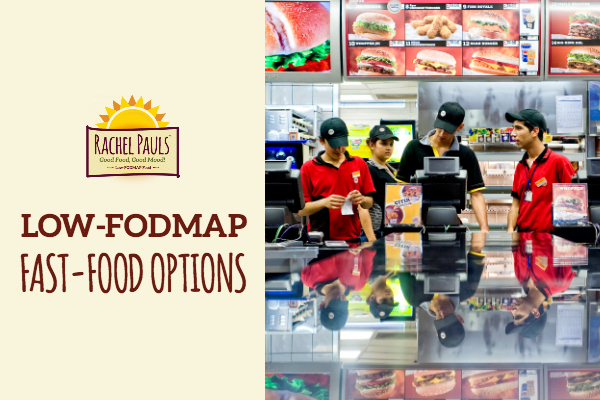 So I did some online investigating, and have compiled low-FODMAP choices that may work for you at McDonald’s®, Wendy’s®, Burger King®, Subway® and Pizza Hut®. In general, eggs and oatmeal appear low-FODMAP at most places. You can also try a side salad. The hamburger patty, to my surprise, seemed the best option at all three burger joints. Plus, if you come prepared with some of your own low-FODMAP condiments and side items, you can put together a satisfying meal on the run. For instance, try packing your own bun or tortilla and use their egg with cheese to make a personalized egg sandwich! Delicious and nourishing. My number-one tip? Know which fast-food chains have ingredient lists on their website. Check them out before you pull up to the drive-through with hungry kids shouting from the back seat. Or, better yet, use the convenient safe-to-eat low-FODMAP fast food list I’ve prepared for you below (for the sandwiches- order plain with no condiments/sauces or onion/pickles). FOR A DOWNLOADABLE PDF OF THIS LIST (GREAT FOR YOUR MOBILE OR DESKTOP) SCROLL TO THE VERY BOTTOM! Pasteurized Processed American Cheese: milk, cream, water, sodium citrate, cheese cultures, salt, color added, sorbic acid (preservative), citric acid, lactic acid, acetic acid, enzymes, soy lecithin Natural flavor in the pork may have onion/garlic. Test sensitivity to this. One slice of cheese should have safe amounts of lactose. Test sensitivity. Remove all bread. No sauces or condiments. Hash Browns: potatoes, vegetable oil (canola oil, soybean oil, hydrogenated soybean oil, natural beef flavor [wheat and milk derivatives]*), salt, corn flour, dehydrated potato, dextrose, sodium acid pyrophosphate (to maintain color), extractives of black pepper. * Natural beef flavor contains hydrolyzed wheat and hydrolyzed milk as starting ingredients. Thick Cut Applewood Smoked Bacon: pork bellies cured with water, salt, sugar, natural smoke flavor, sodium phosphate, sodium erythorbate, sodium nitrite Unclear if the flavoring in the hash brown, and bacon contains onion/garlic; slight amount of wheat is not likely to cause problems. Test sensitivity to this. Remove all bread. No sauces or condiments. Oatmeal Water, whole grain rolled oats, brown sugar, modified food starch, salt, natural flavor, barley malt extract, caramel color Slight amount barley malt extract not likely to cause problems. If you add toppings, check ingredients. Hamburger or Cheeseburger (plain, no bun) 100% Beef Patty: 100% pure USDA inspected beef; no fillers, no extenders. Prepared with grill seasoning (salt, black pepper). Pasteurized Processed American Cheese: milk, cream, water, sodium citrate, cheese cultures, salt, color added, sorbic acid (preservative), citric acid, lactic acid, acetic acid, enzymes, soy lecithin Remove all bread. Order plain. No Sauces or condiments. Test sensitivity to cheese. Side Salad (no dressing or bring your own) Salad Blend: romaine lettuce, baby spinach, carrots, baby kale, lollo rossa lettuce, red leaf lettuce, red oak lettuce, red tango lettuce, red romaine lettuce, red butter lettuce. Ingredients may vary. Shredded Cheddar/Jack Cheese (available for some salad versions): cheddar cheese (pasteurized milk, cheese culture, salt, enzymes, annatto [Color]), monterey jack cheese (pasteurized milk, cheese culture, salt, enzymes), potato starch, cornstarch, dextrose, powdered cellulose (prevents caking), calcium sulfate, natamycin (natural mold inhibitor), enzyme 40 grams of cheese is safe; about 2 slice equivalent. No dressing or bring your own low-FODMAP dressing. Test sensitivity to cheese. French Fries French Fries: potatoes, vegetable oil (canola oil, corn oil, soybean oil, hydrogenated soybean oil, natural beef flavor [wheat and milk derivatives]*), dextrose, sodium acid pyrophosphate (Maintain Color), salt. * Natural beef flavor contains hydrolyzed wheat and hydrolyzed milk as starting ingredients. Beef flavor may contain onion/garlic. Test for sensitivity. No sauces or condiments. Asiago Cheese: pasteurized milk, cheese culture, salt, enzymes Asiago cheese; small amount not likely to cause problems. Remove all bread. No sauces or condiments. Test sensitivity to cheese. Steel Cut Oatmeal Water, steel cut oats, cane juice, rolled oats, salt, cinnamon. May be processed on equipment that also processes wheat. If you add toppings, check ingredients. American Cheese: milk, water, contains 2 percent or less of citric acid, apocarotenal and beta carotene (color), cream, cheese culture, enzymes, salt, sodium citrate, sodium phosphate, sorbic acid (preservative), soy lecithin Remove all bread. Order plain. No Sauces or condiments. Test sensitivity to cheese. French Fries Potatoes, vegetable oil (contains one or more of the following oils: canola, soybean, cottonseed, sunflower, corn), dextrose, sodium acid pyrophosphate (to maintain natural color). Cooked in vegetable oil (soybean oil, vegetable oil [may contain one or more of the following: canola, corn or cottonseed], hydrogenated soybean oil, dimethylpolysiloxane [anti-foaming agent]. Seasoned with sea salt. Cheddar Cheese Sauce: water, cheddar cheese (pasteurized milk, cheese culture, salt, enzymes), milk, cream cheese spread (pasteurized milk and cream, cheese culture, salt, carob bean gum), modified cornstarch, nonfat dry milk, soybean oil, palm oil, whey, sodium phosphate, cream, cheese culture, milk fat, sea salt, salt, Parmesan cheese (pasteurized part-skim milk, cheese cultures, salt, enzyme), butter, sodium alginate, carob bean gum, mono and diglycerides, annatto and apocarotenal (for color), lactic acid, soy lecithin Test sensitivity to cheese sauce or get without. Side Salad (no dressing or bring your own) Garden Side Salad Blend: iceberg lettuce, romaine lettuce, spring mix (baby Lettuces [red and green romaine, red and green oak, red and green leaf, lollo rossa, tango], spinach, mizuna arugula, tatsoi, red chard, green chard), grape tomatoes, cucumbers, red peppers No dressing or bring your own low-FODMAP dressing. American cheese (pasteurized process): cultured milk, water, cream, sodium citrate, salt, sorbic acid (preservative), sodium phosphate, artificial color, enzymes, acetic acid, soy lecithin Smoke flavoring in ham may contain other additives. Test for sensitivity. Remove all bread. No sauces or condiments. Test sensitivity to cheese. Hash Browns Potatoes, canola oil and palm oil, dehydrated potatoes (potatoes, mono and diglycerides, sodium acid pyrophosphate, citric acid), salt, corn flour, enriched wheat flour (wheat flour, niacin, iron, thiamin mononitrate, riboflavin, folic acid), natural flavoring, disodium dihydrogen pyrophosphate (to promote color retention), dextrose Contains wheat and some flavoring. Test for sensitivity. Quaker® Oatmeal Maple and Brown Sugar Flavor Whole grain rolled oats, sugar, natural flavor, salt, calcium carbonate, guar gum, oat flour, caramel color, reduced iron, vitamin a palmitate. American Cheese (pasteurized process): cultured milk, water, cream, sodium citrate, salt, sorbic acid (preservative), sodium phosphate, artificial color, enzymes, acetic acid, soy lecithin Remove all bread. Order plain. No Sauces or condiments. Can add tomato and lettuce. Test sensitivity to cheese. -see next box for cheese ingredients based on choice selected. Egg Omelet Patty (regular): whole eggs, egg whites, nonfat dry milk, water. Contains 2% or less of the following: soybean oil, liquid butter alternative (liquid and hydrogenated soybean oil, salt, soy lecithin, natural flavor, tocopherols (vitamin E), corn starch, salt, xanthan gum, citric acid, white pepper, beta-carotene (color). Egg White Omelet Patty: egg whites, cornstarch. Contains 2% or less of the following: butter-flavored soybean oil (soybean oil, natural flavor), salt, xanthan gum, white pepper Natural flavor in egg may contain onion/garlic. Remove bread. No sauces or condiments. Can add tomato or lettuce. Test sensitivity to cheese. Build your own salad and avoid the bread, choose from these selections (no dressing or bring your own). Bacon Slices: pork, water, salt, sugar, natural smoke flavor, sodium phosphates, sodium erythorbate, sodium nitrite, smoke. Provolone Cheese: cultured pasteurized milk, salt, enzymes. Swiss Cheese (sliced): part skim milk, cheese culture, salt, enzymes Bacon or turkey may have some seasoning in the flavor. Test for sensitivity. Mayonnaise in tuna contains spice, which may contain garlic or onion. Test for sensitivity. No dressing or bring your own low-FODMAP dressing. • Top with sliced tomato, green pepper or other vegetables you can tolerate. Gluten-free crusts at other pizza chains contain some high-FODMAP ingredients; check ingredients lists. Test sensitivity to cheese. Click here to download the chart pdf for desktop. Click here to download the chart pdf for mobile.